I know very few people who, as a child, didn’t absolutely delight in new school supplies. Like I used to do, my children beg me to take them to the store as soon as the first big bins of crayons arrive. Waving the list in my face, they remind me that if they want to get the good colored scissors, we can’t be last in line. Because when you’re in elementary school, color matters. The color of your pencil box, your pencil sharpener, and even more so than those, the designs on your folders and notebooks. I have spent hours with my kids as they sifted through the stacks and shelves of spirally bound paper, trying to find that one cover design that best fits their personality. Some mothers would rush them along, throwing a solid blue or red notebook in the cart, but not I. 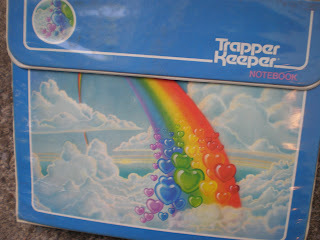 For I am a proud gradutate of the era of the Trapper Keeper. 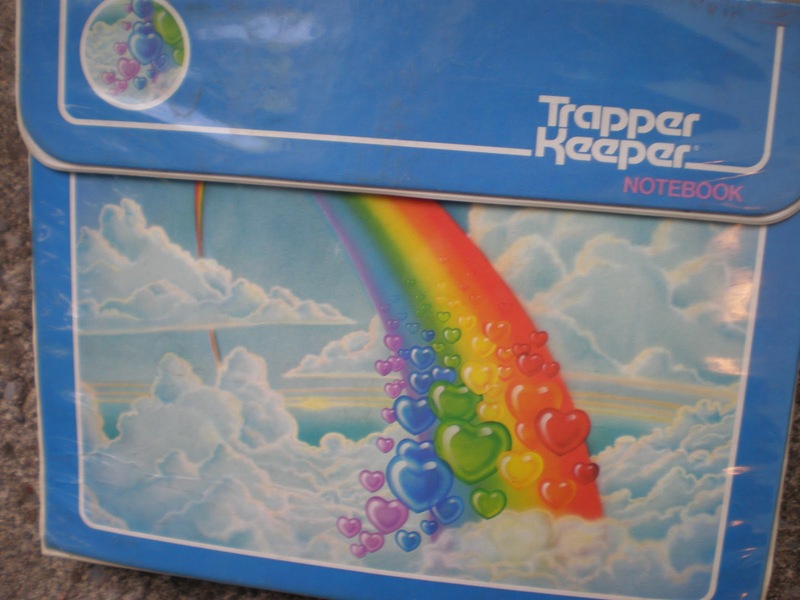 Children of the Eighties unite with me, and pause for a moment to that glorious day when you got to go to the store and choose your Trapper Keeper. (And mothers and fathers who took us all to the store, thank you for spending all that times with us as we chose our all-important supply.) A Trapper, as we called them, was nothing more than a three-ring binder that held folders. But the cover of the Trapper was decorated with an image and then sealed in a heavy vinyl so that you were stuck with that picture all year. And that picture practically defined you. Were you a sports lover? Animal lover? Unicorn fan? Pop music enthusiast? Were you a rebel at age ten with the plastic cover ripped off your Trapper so that you could scribble dark messages across the football player’s face, or maybe you wrote your boyfriends name with a zillion hearts around it until the big break up and you crossed off his name and wrote someone else’s? It only took a second to know who you were dealing with on the first day of school when you sat down in your permanent seat arrangement and looked at the kid next to you. So it goes without saying that when I take my own children school supply shopping, it turns into an entire morning affair. I know the importance and the consequence of buying a Cleveland Browns versus a Pittsburgh Steelers folder, and I understand why one would or would not want to be marked by a glittery peace sign on her homework folder. Even at the young ages of seven and ten, my kids do, too. So there we stood, filing through folders until they found the ones that suited them best. Mission completed, I again send them off to school again for another year in the hands of someone else, at the mercy of the kid they have to sit next to. Well worn from summer amusement and kissed by the sun, they are armed with their number two pencils (all sharpened) and their backpacks (no wheels), their brand new crayons and pointed scissors, and of course their folders and notebooks (no Trapper Keepers.) My son, who could care less about cartoon characters and doesn’t love sports enough to brand himself with them, chose some sort of electric guitar, budding musician that he is. My daughter picked an earthy-colored flower design that is awfully sweet, but not nearly as sweet as she. Ever growing and changing, there’s nothing to say that in a few months they won’t ask for different folders, learning that they really do love glittery peace signs or that professional basketball players are a newfound passion. Chances are they’ll need new crayons, too, so off we’ll go again to support the little personalities and actual people they are growing into. As long as I don’t find the names of heavy metal bands etched in or a list of boy names with cupid arrows, I’ll be happy.